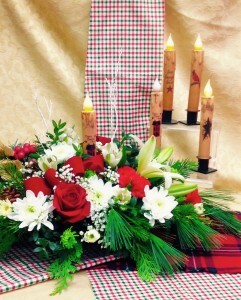 Lovely Holiday design includes a battery operated country taper candle. The candle has a soft flickering light with a real wax texture. It also includes a black metal country base to hold for years to come. Available with a Cardinal design or a "Home Sweet Home", or a Country Star or a Country House motif. Each is wonderful. You may request your favorite style in check out. Larger size centerpiece includes red roses!